This document describes the step to configure a Cisco Firepower using the ThreatSTOP Centralized Manager with Web Automation enabled. Automated retrieval and updates of IP Defense policies from ThreatSTOP’s systems to the Firepower. Automated collection and upload of log files from the Firepower sensors to ThreatSTOP’s systems. The integration is performed by a Linux-based virtual machine provided by ThreatSTOP, named ThreatSTOP Centralized Manager (TSCM). After its initial installation, the TSCM will retrieve the list of subnets matching the policy configured via the ThreatSTOP Admin portal and make them available as a new Security Intelligence feed for Firepower. Optionally, the Firepower sensors can be configured to send the connection log events to the TSCM via syslog and the TSCM will package and upload log files to ThreatSTOP’s Portal, for analysis and reporting. Client configuration settings are managed on the ThreatSTOP portal, instead of using the TSCM command line. The TSCM reports problems applying policies or uploading logs to the ThreatSTOP Portal, providing more visibility into potentials system or network problems. The current version of TSCM is compatible with all Firepower devices running Firepower version 6.x. If you have already created a device entry in the portal, and are familiar with the installation procedure, you can access the TSCM parameters below if you access this document from the Portal Device page. You will need a Hypervisor such as vSphere, ESXi, Virtualbox or Hyper-V to deploy the image. Important: Time must be kept synchronized for configuration and policy updates to function. To perform this installation, you need an admin account on the FMC. During this step, you will create a device entry on the Admin Portal. 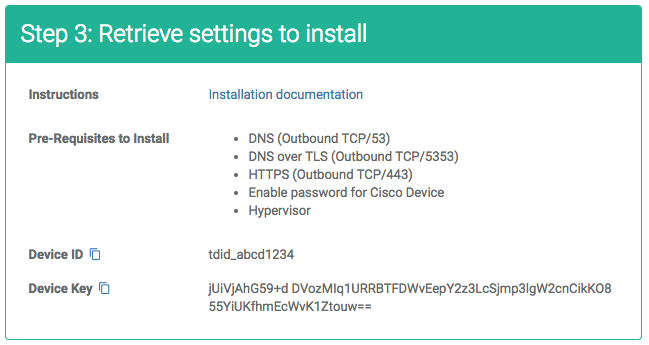 You will select a device type (Cisco Firepower) and enter the configuration settings. A minimum configuration only requires a handful of settings but optional, advanced options are also available. The Admin Portal will display a form to enter the device settings described below and the links to retrieve the TSCM image. Nickname: this is a mnemonic name used to identify the device. It can be set to any string (A-Z, 0-9, - and _). If you create multiple device entries, each entry must have a unique nickname. The Nickname will be used to identify the device on the TSCM and in the Reporting user interface. Policy: select a pre-defined policy or a customized policy. It must be an IP Defense Policy. IP Type: Access to the ThreatSTOP services is controlled in part using an ACL allowing the device IP to connect. If your device has a static public IP address (the most common case), select static. If your device has a dynamic public IP address, the ThreatSTOP services can lookup the IP address using a DNS fully-qualified name (FQDN). Public IP address: In static mode, this is the public IP address of the TSCM. It is possible to configure multiple device entries with the same public IP address. Domain name: In Dynamic mode, this is a DNS FQDN which must be kept up-to-date as an A record pointing to the TSCM’s dynamic IP. Internal IP address: This is the internal address of the FMC console. 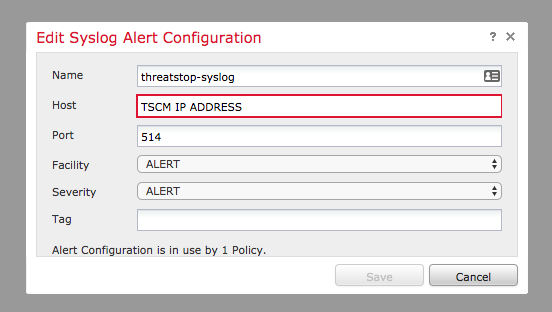 Enable Log Upload: If enabled, the TSCM will send logs received from the device to the ThreatSTOP reporting system. This is the recommended setting. When disabled, logs for this device will not be available for reporting in the Portal. Syslog IP address: While the Firepower retrieves the ThreatSTOP feed using the FMC, log events generated by the policy are sent using syslog (TCP/514) directly by each sensor. If your configuration enables log upload, you need to add the IP address of each sensor to allow the TSCM to receive syslog messages. Maximum Policy Size: Optioan limit on the number of entries in the policy. If the policy becomes larger than this setting, the TSCM will truncate it down to the Maximum Policy Size. Upon saving the form, a device entry will be created in ThreatSTOP’s cloud. Note: It typically takes 15 minutes for new device IPs to become registered in the Policy service. 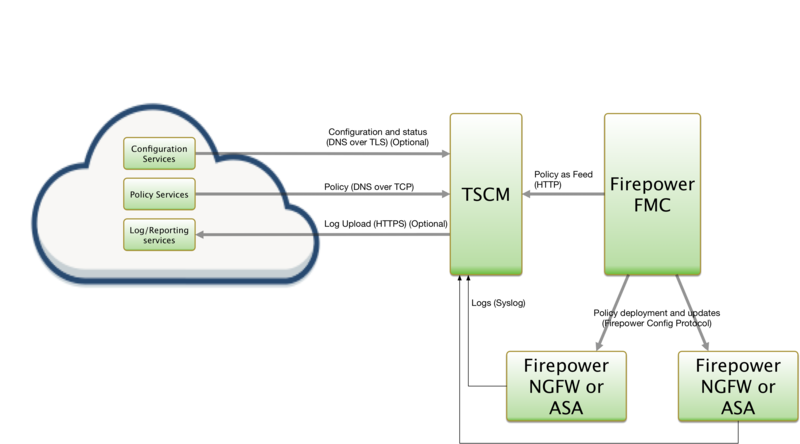 The TSCM supports the following advanced settings, which cover uncommon Firepower configurations or network environments. DNS Port: The TSCM uses TCP Port 53 (outbound connections) to retrieve policy data. If this port is blocked or filtered (for example, networks using a DNS Application Layer Gateway), use this setting to switch to TCP Port 5353. Log file size: the TSCM will upload logs after 15 minutes and when the log file size is reached. For systems under very heavy network traffic with many blocked connections, lowering this value will cause logs to be uploaded more often. Enable policy updates: this setting can be used to temporarily disabled policy updates by the TSCM. This is not recommended but can be used if device configuration changes needed to be suspended. Log Upload Proxy: If your environment requires using a proxy to reach HTTPs URLs, you can specify the address of a proxy. The proxy must support HTTPs using the CONNECT protocol. The proxy address must be http://address:port, where address is either an IP address or a fully-qualified domain name. HTTPs proxies are not supported. If you provide a proxy URL, the TSCM configuration will also prompt you for an optional user and password during the TSCM installation. Provide them if the proxy requires authentication. After creating the device entry, the next step is the download using FTP and installation of the TSCM image. You can choose between the OVA format (ESXi/vSphere, VirtualBox, Xen…) and the VHD format (Microsoft Hyper-V). The download link is listed in the Step 2 section, as shown in this image. Click on the Copy Download Link to copy the link to your clipboard. For your security: after downloading the file, we encourage you to validate its SHA 256 checksum. Compute it as shown below and compare it to the checksum in the Portal. Import the OVA or VHD file in your Hypervisor to create the virtual machine and start it. The TSCM virtual machine will use DHCP to obtain its IP address. If your Hypervisor doesn’t show the IP address assigned to the virtual machine, you can retrieve it from the console of the TSCM: it is displayed as part of the login prompt. Note: The TSCM Virtual machine boots using DHCP by default. To change the network configuration settings (e.g. switch to a static network configuration), run the tsadmin command described in this document. The network settings can be configured at any time during the installation process. After booting the TSCM and logging in via ssh, the third setup step will link the virtual machine to the device entry created in Step 1. The TSCM has a configuration utility named tsadmin. A reference for the utility is provided here but we will cover the full installation steps below. Obtain the Device ID and Device Key from the device configuration page. You can copy them to your clipboard by clicking the icon. The Device ID is the string tdid_ followed by 8 alpha-numerical characters. The tsadmin command will first retrieve the device settings from the ThreatSTOP Portal. If the command fails, check the Troubleshooting section. Once the command completes, the TSCM has succesfully linked itself to the device entry in the portal. From this point on, the TSCM will retrieve policy data (IP subnets) and make them available over HTTP every hour. The following steps assume that you have access to the Firepower Management Console (FMC) and a configuration that includes at least one policy and one device. Name: select a name of your choice, such as threatstop-block. You can trigger the feed update (Update feeds) to validate the FMC’s ability to connect to the TSCM to retrieve the feed. 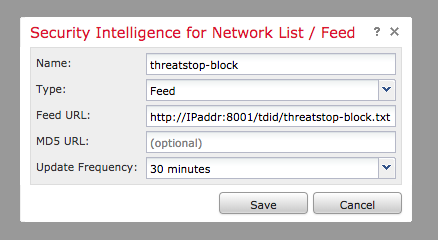 Repeat these steps and add the ThreatSTOP allow feed as a whitelist using the Add to Whitelist button. Note: Firepower doesn’t log events generated by whitelist feeds. Deploy the updated policy using the Deploy button. Select the devices to update. It can take a couple of minutes for the policy to be propagated and take effect. If log upload is enabled, the TSCM will now upload logs every 15 minutes, as long as there were connections blocked by the policy since the last upload. The logs can be analyzed in the IP Defense Reports 15 minutes after they’ve been uploaded. After deploying the policy, generate log entries by trying to reach our test address through the device. The command should fail to connect. Log files are stored in /var/log/threatstop/devices/<device name>/syslog. 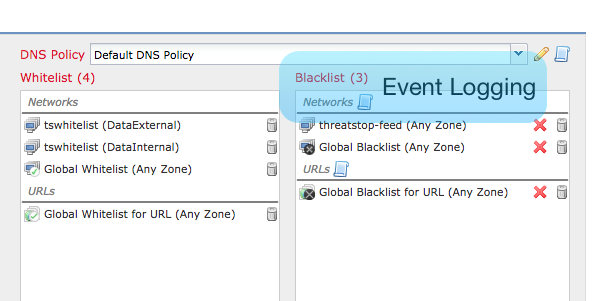 If no log file is present, check that events are being logged using the Connection Event page (**Analysis > Connection > Events) if the policy is configured to log to the event viewr. Also check that the IP address of the sensor is included in the syslog IP setting of the TSCM (account for NAT if applicable) and that the sensor can reach the TSCM over TCP/514. If the command attempts to upload a log but fails, check the connectivity of the TSCM to ThreatSTOP’s log service, described in the connectivity section of this document. A single TSCM image and a single device entry can be configured to publish a policy to multiple Firepower sensors. In this configuration, the same policy will be made available to each sensor, and logs for every sensor will appear under the same, unique device entry in the ThreatSTOP Reports. It is possible to create multiple device entries in the portal, and link one (or different TSCMs) to these entries. In this configuration, multiple feeds can be added to the FMC, and associated with different sensors. This also allows reporting on each sensor independently. Note: A single TSCM image can also manage other devices (such as Cisco ASA, ISR, Fortigate Fortinet and Palo Alto Networks PAN-OS devices). After the initial configuration is completed, settings can be edited on the Admin Portal and will be reflected on the device within 5 minutes, including Policy configuration changes. Failures are reported on the Device List page of the portal. Next, delete the device on the TSCM. This will stop policy retrieval and log forwarding. Note: You can relink a same device entry after it’s been deleted by re-issuing the tsadmin add command. The last step is to delete the device entry on the Portal, using the Device List page. This step will caused the log data from the device to be unavailable in the Reporting interface of the Portal. If needed, you can recreate a new device entry for the same device, with the same or different settings. Note that the new entry will have a different Device ID for linking the TSCM. Failure to link the device: tsadmin add fails with this error: “Failed to connect to Web Automation services”. The common cause is a network connectivity problem using DNS over TLS (Outbound TCP connection to ts-ctp.threatstop.com on port 5353). The Device ID or Device Key is not correct. The system time is not correct. The virtual machine run an NTP client which must be up-to-date. Check its status with the timedatectl command. The new device entry has not been activated yet. Wait 2-3 minutes and retry. A network connectivity problem using DNS over TCP (Outbound connection to ts-dns.threatstop.com on Port 53). The policy is not available yet. It typically takes less than 15 minutes for new devices and new policies to be activated in the Policy Service. If the network connectivity is ok, and 15 minutes have elapsed since the device entry was created, please contact ThreatSTOP Support at support@threatstop.com. Part 1, Part 2 and Part 3 of a video series by Cisco to configure Firepower instances in AWS.